one day, he came across a book entitled “The Doll” by Carl Fox. he took them to a local crafts show, they instantly sold out. 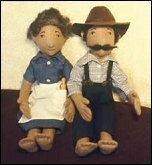 become his first molded felt dolls. specialized machinery to increase production. for many times their original value. Wright Collectors’ Club was inaugurated in 1996.
quality in craftsmanship and integrity of design. of R. John Wright doll collectors. Photos courtesy the R.